Today I decided to use non-tarnish artistic wire instead of my usual sterling silver. 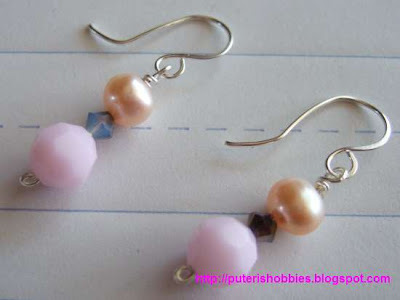 I got tired of looking at the tarnished state of my sterling silver ear-rings! The wire I used is a 22 gauge and it is quite soft. I had to be careful when I did the wire-wrapping. It bends out of shape really easily. 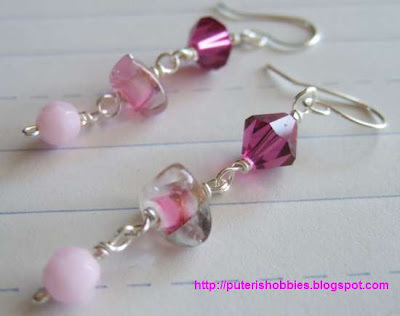 Another pair of swarovski crystal ear-rings with a triangle shaped glass bead in the middle for interest. I made two pairs of these ear-rings. 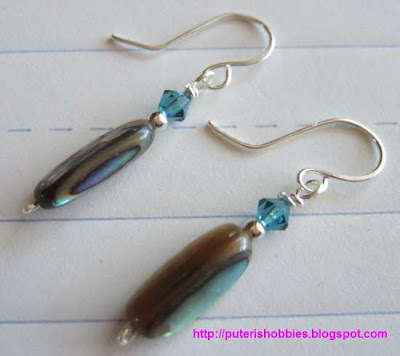 The long bead is made of abalone shell. The small round bead is sterling silver and the blue zircon bicone beads are swarovski crystals. The extra pair I gave to Kathy, my good friend, and the kids' reading tutor. Wah wah...cantik bala earrings nyak.RIndu aku meda bala accessories di gaga nuan.Ba Kuching ditu makin mayuh nyual bala perengka begaga ke jeweleries and so far aku meda harga ba sigi kedai di kenyalang park paling affordable and sidak iya bisi complete barang kena tailoring,sewing and crafts.